The new DJI Mavic Pro drone is an amazing advance in both hardware engineering and vision software. First, of course, it's foldable. The Mavic Pro's arms fold in to collapse to 3.26 x 3.26 x 7.79 inches -- about the height of a water bottle by the cross-section of a wallet. And it's light, at 1.64 pounds. But it still carries five cameras and eight additional sensors to track and control its movement, and even with the smaller size the battery has enough juice for it to fly for up to 27 minutes. It can take off by itself, and hover in in winds up to 24 mph. It can fly itself to a destination that you tap on the screen -- while automatically avoiding obstacles in its path. It can automatically follow a target that you select on the controller display, and then stay in position behind, in front, to the side, or orbiting in a circle -- or even keep the camera locked on target as you fly it around. It can maintain a fixed distance over ground, even as you navigate changing terrain. When you are done (or the batteries are running low), it can automatically return home (again avoiding obstacles). Additional new features include a Tripod mode that slows the movement for more precise positioning and framing (especially useful indoors), and a Gesture mode to control the drone directly with simple arm and hand gestures. And, the Mavic Pro records video up to Cinema 4K resolution, 4096×2160 at 24p, and streams the live video back to your controller at up to 1080p -- from a distance of over four miles away. The Mavic Pro will begin shipping October 15. It's priced at $999 with the remote controller, or $749 without. See full article at Videomaker.com. 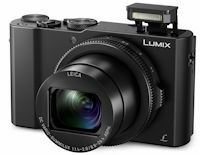 Panasonic has announced three impressive new digital cameras, all featuring 4K photo and video recording. These are packed with technology both for creative control when shooting, and for performing in-camera editing -- since you can use the built-in Wi-Fi to transfer images and upload to social media services. The new cameras start with the LUMIX LX10 compact camera, an "LX7 on steroids" -- small enough to fit in your jeans pocket, and still packed with features including a 1-inch sensor, a manual aperture ring, and macro shooting as close as 3 cm. It will be available in November for $699. 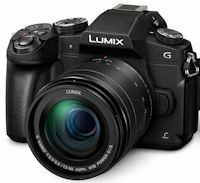 Then the LUMIX G85 is a rugged field shooting camera -- weather-sealed to be splash and dust proof -- and loaded with helpful technology including an electronic shutter for shooting at up to 1/2000 second without the vibration of a mechanical shutter. It will be available in October for $999 with a 12-60mm lens, or $899 for the body only. 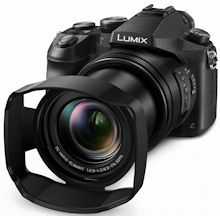 And the LUMIX FZ2500 is a hybrid compact digital camera, a "GH4 with a fixed lens" -- with the built-in lens providing impressive functionality with less weight. It has the same 1-inch sensor as the LX10, and features 20x optical zoom, built-in ND (neutral density) filters, Cinema 4K video recording, and live video out. It will be available in December for $1199. Plus you can use 4K-res video recording to do in-camera editing to HD-res videos, with Live Cropping to pan or zoom within the 4K frame without moving the lens, plus add effects after recording. And for stills, the 4K PHOTO modes use 4K burst video recording to help build a high-res photo from a set of images, including extraction of the best frame from a 30 fps burst file, Post Focus to select the in-focus area, the new Focus Stacking to adjust the depth of field by combining multiple images, and Light Composition to combine the brighter pixels for night scenes. Laptops have gotten wonderfully thin and light, but now the associated power supply seems awfully bulky and heavy in comparison. The good news is that new power technology can deliver much more efficient power conversion, which means more power with significantly less bulk and weight -- and less heat from wasted energy. Two different companies have recently delivered laptop chargers -- The FINsix Dart (see next post), which is smaller and lighter, and the Zolt Laptop Charger Plus, which can simultaneously charge two mobile devices along with a laptop. Both come with adaptor tips to fit most popular laptops, and the Zolt also supports the Apple MacBook. The Zolt Charger is a portable power hub that you can grip in your hand, at only about 3.7 x 1.3 inches and 3.5 ounces -- so it's around 4X smaller and 3X lighter than current laptop chargers. The unit has three USB ports on side -- one for a laptop and two additional for mobile devices, including smartphones, tablets, portable speakers, and digital cameras. It has a total capacity of 70W, enough to power a 65W laptop plus a couple iPhones at up to 5W / 2.6A each. 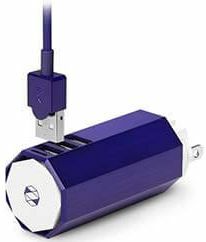 You connect your laptop with the included 6 foot laptop cable, after attaching one of the 8 interchangeable PC power tips, which are compatible with 90% of current laptops. Additional spare cables and MacBook Mag cables also are available for $19.99. The Zolt works globally, with 120 - 240V, 50/60 Hz input. It also automatically regulates power to the connected devices, with over-voltage, short circuit, and over-temperature protection. When you travel, the prongs on the end fold up, and you can wrap the cord around the bases, since the cord is thinner than typical power cables. As a bonus, the base also rotates up to 90 degrees so you can access adjacent outlets. The Zolt has significantly reduced bulk and weight in my travel bag by replacing the old laptop "brick" with its multiple cords, and also removing a separate USB adaptor. The Zolt Laptop Charger Plus is available for $99, in graphite, ultra violet, and electric orange. Two different companies have recently delivered laptop chargers -- The FINsix Dart, which is smaller and lighter, and the Zolt Laptop Charger Plus (see previous post), which can simultaneously charge two mobile devices along with a laptop. Both come with adaptor tips to fit most popular laptops, and the Zolt also supports the Apple MacBook. The FINsix Dart Charger is described as "the world's smallest laptop charger" -- At only 2.75 x 1.1 inches and around 3 ounces, it's 4X smaller and lighter than current laptop chargers. The included 6 foot cable includes an inline 2.1A USB port to simultaneously charge another portable device. The product includes 9 universal power tips that support 95%+ of today's PC laptops and notebooks. However, it currently is not compatible with the Apple MacBook and Microsoft Surface. The Dart has a total capacity of 65W, and works globally with 120 - 240V, 50/60 Hz input. It also has over-voltage, short circuit, and over-temperature protection. 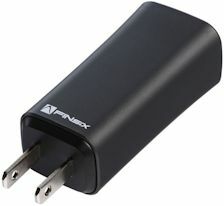 The FINSix Dart Laptop Charger is available for $99, in blue, magenta, silver, gunmetal, and orange. It's ridiculously small -- something like a roll of quarters (but less than half the weight). Entries posted to Manifest Tech Blog in October 2016, listed from oldest to newest.